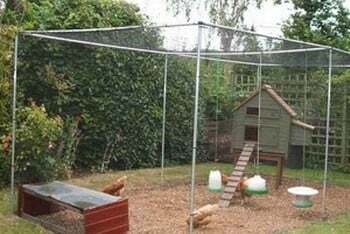 All cage kits include framework, connectors, roof and side netting, door kit and all necessary pegs, clips and ties. 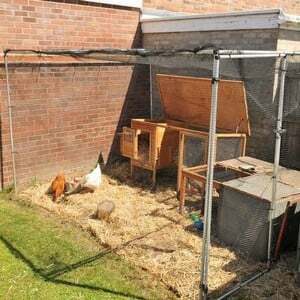 Not only do the framework and netting combine to protect your chickens and game birds but being of walk-in height, our Poultry Cages are simple to enter for cleaning and also feeding the chickens. 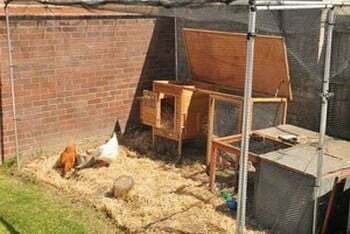 When choosing the size of your Poultry Cage please note that our cage sizes are generous and where space is limited please allow an extra 2% to the measurements for fitting. 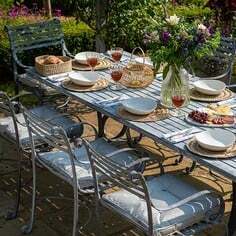 I love Harrod Horticultural and have been using their products for ages. We have a fruit cage that has been up for nearly 10 years. The aluminium chicken runs are excellent, technically, they should be easy to put together, but in reality..NOT! The instructions are appalling, particularly, as others have said, the door latch. If you get it wrong, there is almost no way of going back to start again..it's too late! The fittings are so tight (good) that you can't take it apart again to put the door latch the right way up! BY the time we got to the second one, we were a bit more aware, but it was still not easy! 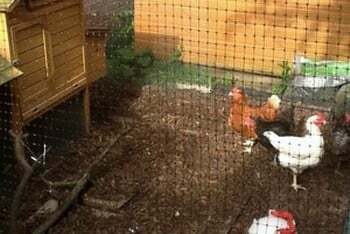 However, my chickens are IN, much to their annoyance, so I have to thank HH for producing a relatively inexpensive solution to a massive problem. Many thanks for your feedback, your comments have been passed onto our R & D Dept. for further review. The cage does exactly as it says. The only (slight) issue are the instructions for the door/hinges which are not very clear. However once you figure this out the whole thing goes up quickly and looks very good. It's sturdy and strong. I did add chicken wire around the bottom of the cage. I would definitely recommend especially given the head height you get over other comparable products. 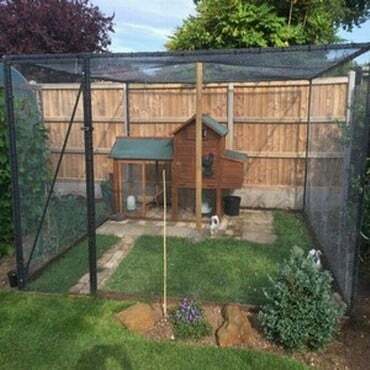 I ordered this cage on the phone and the person I spoke to said the netting was plastic coated wire so when it arrived I was disappointed, I spoke to Harrod and they confirmed the information I was given was incorrect, although it is quite strong netting one month later a squirrel has found a corner to chew and is in the cage, we don't have a big problem with squirrels but it has proved my fears that it can be chewed easily, I have bought the extra metal fine wire for the bottom metre to protect them from foxes and this is good. 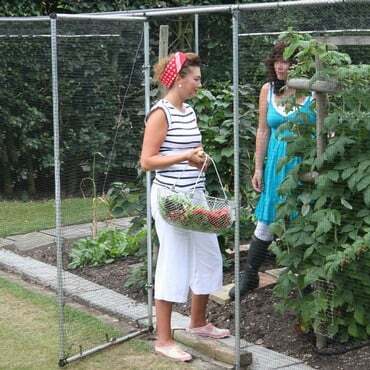 Overall I would say the concept is good the frame is great and the area gives plenty of room when they aren't in the garden but the netting is not adequate. Many thanks for your comments which have been passed onto our customer service manager and R & D Depts. 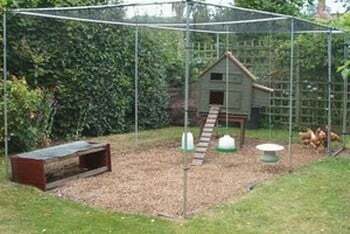 We are sorry our level of service did not meet your expectations on this occasion and agree it is advisable to re-enforce the bottom of the cage with a wire netting if you have a particular problem with foxes or squirrels. 1. 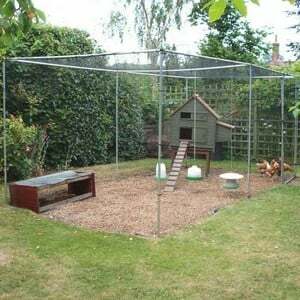 What are the benefits of purchasing an aluminium poultry cage from you, rather than a steel version? The main reason for opting for an aluminium cage is that it will cost less; although not as rigid and solid feeling as a steel cage, aluminium is quite up to the task. 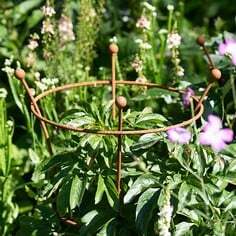 If aesthetics are a consideration, steel cages always look better as the aluminium framework can stand out a little, where as the black powder coated steel cage blends into the garden better. 2. Are the support braces the same for corners and sides? 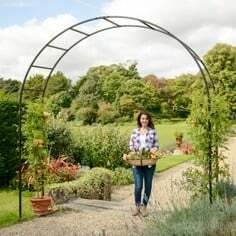 The support braces used for aluminium fruit cage are universal, so can be used for both the corners and the sides. You can even split one brace into two, to make two single sided braces, which can be used to strengthen the uprights used to support the door unit. 3. How many support braces would I need for my poultry cage? 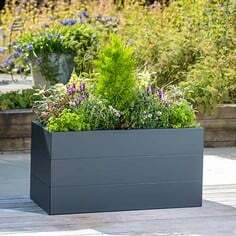 These give a cage extra rigidity when exposed to high winds, or softer soil. For these specific cages, we would recommend that you brace all 4 corners of a cage. 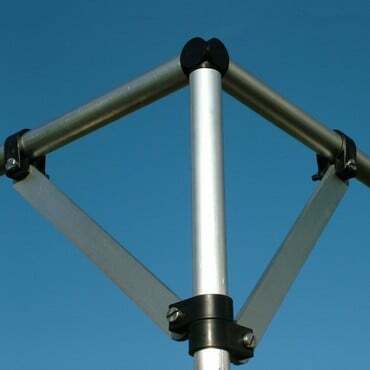 For cages over 6m we recommend that at least the middle upright is braced. Please contact our Customer Services Department or call us 0333 400 6400 (local rate) to find out exactly how many braces you will require for your cage. 4. How many footplates would I need for my poultry cage? 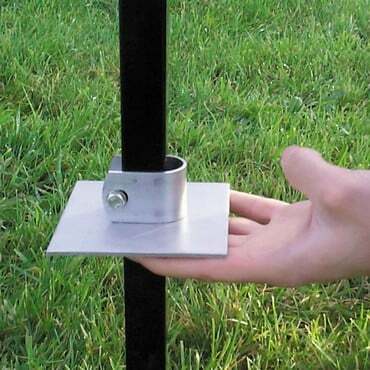 These ensure that uprights maintain position on softer grounds, or in areas that are exposed to windy conditions. We recommend that all uprights are fitted with a footplate. Please contact our Customer Services Department or call us 0333 400 6400 (local rate) to find out exactly how many are required for your cage or download our Heavy Duty Cage Footplates and Sockets Guide for an instant answer. 5. Why don’t you supply ground sockets for Aluminium cages? Our steel ground sockets cannot be used with the aluminium walk-in fruit cages because the steel and aluminium would react with each other, and eventually corrode. Unfortunately we are unable manufacture ground sockets from aluminium because the material would not be strong enough to be hammered into the ground when putting into position. 6. Why don’t you supply the decorative walk-in cages using aluminium? Supplying the decorative fruit cages in aluminium is not something that we have ruled out for the future, however our aluminium cages are often purchased by the more cost conscious customer, and therefore anything that would add significantly to the price of the cage without improving the functional aspects of it, would put them off buying it. Also, due to the design of the decorative cages, it is very difficult to remove the roof netting in the winter. Decorative steel roof units can withstand the possible snow loading, which a similarly designed aluminium cage would not. 7. Where do I position my door unit? 8. 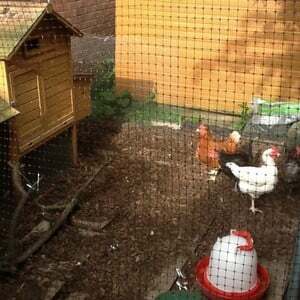 Can I order extra parts for my poultry cage e.g. spare connectors? Yes, you may please contact our Customer Services Department or call us 0333 400 6400 (local rate) to order. 9. Can I see one of these cages already installed? Being a mail order company, we do not have our products on display. 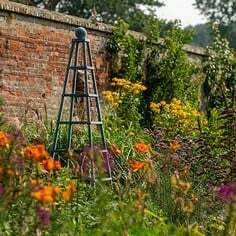 You may however visit one of our show or reference gardens dotted around the country. 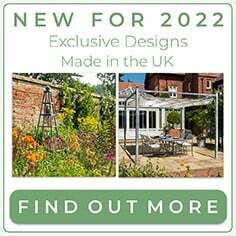 Please visit our Show Gardens section for more information and contact details. The aim is always to achieve a level roof 2m from the ground, so that the doors and the side netting work correctly. 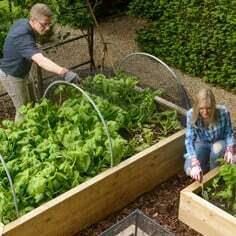 Aluminium cages can cope with locally uneven ground of about /- 10cm on one upright per bay, but it is better to level any dips or bumps before erecting the cage. We can't unfortunately offer aluminium cages for significantly sloping sites - you would need a steel cage in this situation. Yes they can. Braces are easy as they can be added to a fully assembled cage in minutes but footplates are a little trickier. You'll need to remove the horizontal bars and connectors from the uprights in order to add these parts so it's far easier to plan your purchase carefully, order the footplates with your cage and fit them at the assembly stage. The braces are designed to be fitted to the external uprights, but there is no reason why you cannot also add them to the internal uprights, to give your cage that little bit of extra stability. Unfortunately altering a standard cage will affect its guarantee. If you require a size that is not advertised as a standard size, please complete our Online Quotation Form, email our Made to Measure Team or call us on 0333 400 1444 (local rate). 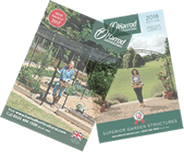 For a non-standard, or ‘bespoke’ size fruit cage, if you require a size that is not advertised as a standard size please complete our Online Quotation Form or email our Made to Measure Team or call on 0333 400 1444 (local rate). 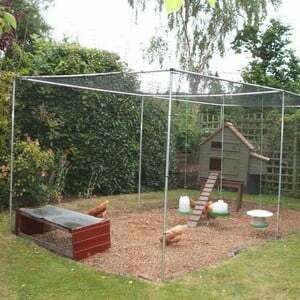 Due to the extremely small mesh size of both of our insect meshes, we do not advise that you cover a walk-in cage with this material; the wind would not pass easily through the mesh, so would act a little like a boat sail. This could cause damage to the netting and the cage.